To model basic room acoustics, we built a Matlab prototype of a hybrid convolution-algorithmic reverberator. Reverberation in a real room has two main components: early reflections and late reverberation. You perceive early reflections within about 100 ms of hearing a direct sound. These reflections give important cues about your location in a room relative to the walls, floor and ceiling. Late reverberation is the ambience you perceive after about 100 ms. Synthetic room impulse response created using Stephen McGovern’s RIR Matlab function (a simple model for room acoustics). 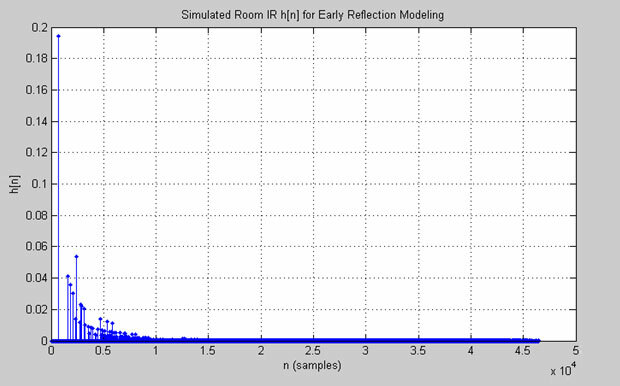 To simulate the early reflections of a room, this low order FIR filter is convolved with an audio signal. This process is the first stage of the hybrid reverb. Early reflections can be modeled by finite impulse response (FIR) filtering. Moorer’s reverberator traditionally uses a tap-delay line as the FIR stage. Instead, our hybrid reverberator uses virtual room dimensions to compute early reflections, simulating the impulse response (IR) of a room. The early reflections model is functionally equivalent to an FIR filter. As an input audio signal passes through the first stage of the reverberator it gets filtered (i.e., convolved) with the IR of the virtual room model. The late reverberation model is based on the work of Schroeder. The early reflections are fed into a stage of parallel comb filters, followed by a series of allpass filters. This is a computationally efficient way to simulate the reverb tail because it is implemented with infinite impulse response (IIR) filters. The system of digital filters gives us full customization over the reverberation time (RT60) parameter. The early reflections and late reverberation are combined to form a simple acoustic model of a virtual room. It can be tuned to represent different sized acoustic spaces. The prototype uses a simple, synthetic room impulse response for the first reflections model, but the realism can be improved by using measured room impulse responses or a more advanced early reflections model. With proper calibration this could yield an efficient, highly tunable, realistic digital reverb effect. Check out the presentation to learn more about reverberation. You’ll find more cool stuff on the surround sound convolution reverb page, including how to measure the impulse response of a room, and how to create convolution reverb.